Gain access to Windows Experience Index score on Windows 10. From now on is quite simple, just install ChrisPC Win Experience Index software and you will get back the Windows interface that you are already familiar from Windows 7 and Windows 8. Once you have installed ChrisPC WEI, click on Rate this computer button and wait while your computer is beeing tested by the Windows System Assessment Tool - WinSAT. ChrisPC Win Experience Index was tested successfully on Windows 10 build 9926 and Windows 10 build 9860 release. On some computer configuration the Windows System Assessment Tool - WinSAT might fail to calculate the WEI score so no ratings will be shown by ChrisPC WEI. In this case click on "More details" button and see where the assessment fails. As Windows 10 is still in Technical Preview, we expect WEI WinSAT rating to work without issue on most configurations in next Preview Builds. You wonder what gaming or graphical processing power unleashes your PC/Laptop hardware? Just get the Windows indexing scores calculated by Windows using ChrisPC Win Experience Index. Totally convenient, ChrisPC Win Experience Index runs on any Windows version on 32 or 64 bits, but aims to be used mainly for Windows 8.1 and Windows 10. ChrisPC Win Experience Index is a free software for non-commercial use. Brings back the Windows Experience Index to Windows 8.1. Brings back the Windows Experience Index to Windows Technical Preview. Rate your computer on Windows 8.1 with 1 click. Rate your computer on Windows 10 with 1 click. 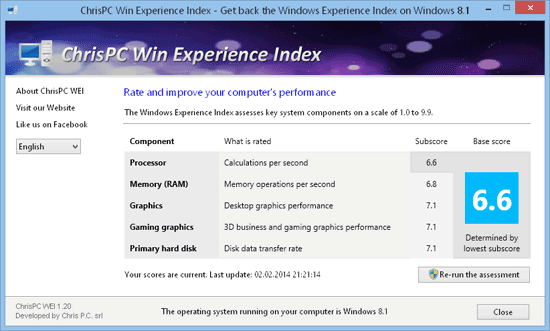 Fast access to Windows Experience Index scores on Windows 7, 8, 8.1 and 10. Share your WEI scores as a JPEG image, Text file or copy to clipboard to your friends. See your computer ratings for CPU, Memory, Storage Disk, Graphics, Gaming. Re-run assessments with a single click on Windows Vista, Windows 7, Windows 8, Windows 8.1 and Windows 10. Multi language interface: English, German, French, Portuguese, Romanian. What is the Windows Experience Index ? The Windows Experience Index measures the capability of your computer's hardware and software configuration and expresses this measurement as a number called a base score. A higher base score generally means that your computer will perform better and faster than a computer with a lower base score, especially when performing more advanced and resource-intensive tasks. Ever wonder how a PC you own or want to buy, stacks up against others? The Windows Experience Index is one way to find out. When you're shopping for a new PC, the Windows Experience Index can help you find the model that suits your needs. Scoring a PC you already own can help pinpoint slower components worth upgrading. A PC with a score of 2 is typically sufficient for basic tasks like text processing or web browsing. Running the Aero desktop experience on Windows 7, requires at least a 3, while graphics-intensive software frequently requires a 4 or higher. All mentioned trademarks Windows, Windows Vista, Windows 7, Windows 8 and Windows 8.1 are trademarks of Microsoft Corporation. The steady development and addition of features to this great program is the way software should be designed! Copyright © 2002-2019, Chris P.C. srl. All rights Reserved.